A mass Voluntary Blood Donation Camp was organized by the All Bodo Students Union (ABSU) and its movement group like the NDFB (P), PJACBM at Kokrajhar Girl’s Higher Secondary school . Over a hundred volunteers donated blood to the Kokrajhar blood bank. 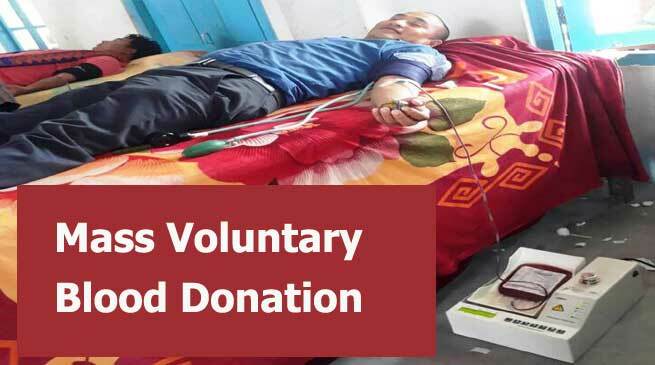 The initiative is being guided by Voluntary Blood Donor’s Association, Jharkhand and the Ant, a Chirang based NGO with the help of local Blood Bank. According to ABSU spokes person 10000 units of Blood will be donated by this year in different parts of the state for Pregnant Women, Children and Cancer Patients. The blood donation camp will be held at Kokrajhar, Chirang, Baksa, Udalguri and Sonitpur starting today. ABSU Leaders stated that this vision of the ABSU is start a new beginning of human relationship and humanity by giving drops of pure blood to someone who are struggling for to live with the help of few drops of Blood. The ABSU leader said the Blood donation is one of the noble initiative to correct our self and re-bridge the human relationship for peaceful co-existence in future. He said the step aims to try reduced the number of death for crisis few drops of blood. “The Bodos are very simple and easy going people, the deprivation from constitutional right had been the reason for long drawn unrest in the society which smash the normal live. The Bodos are very much concern on the protection of identity and living with dignity so they are very much determined for their self determination. Protection of land and all traditional and customary values are very much serious issue for the community, said ABSU Leader. ABSU Leader stated that the new generation of the society trying their best to correct the way of movement and sustain it until they achieve the goal. “Blood donation is one of the noble initiative to correct our self and re-bridge the human relationship for peaceful co-existence in future. The organization will try reduce the number of death for crisis few drops of blood in state, nation and even out of the nation. We will try to provide blood for children, pregnant women and cancer patients in priority. Meanwhile “Blood donation is a noble cause and it is pleasuring and encouraging seeing so many volunteers under the ABSU are coming forward for blood donation.